The Gorkha Janmukti Morcha affiliated union of voluntary teachers, the Janmukti Insecure Teachers' Organisation, today started an indefinite dharna outside the office of the Darjeeling District Inspector of Schools demanding verification of their documents and subsequent regularisation. 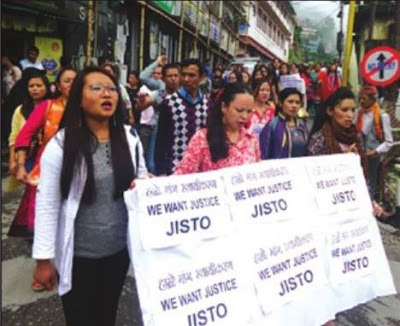 The JISTO, which comprises more than 500 voluntary teachers working in 129 junior, high and higher secondary schools in the Gorkhaland Territorial Administration area, decided to stage the dharna after nearly 301 of their peers received approval for regularisation recently. It may be mentioned here that after a major chunk of the JISTO members joined the TMC, the process for their regularisation started in the month of February this year. Sources have said 476 voluntary teachers have been verified so far and regularisation confirmed of about 301. The GJM has alleged that only those who have joined the TMC have been regularised. On March 24, about 85 members quit the JISTO in Darjeeling saying the delegation that had gone to Kolkata to pursue the regularisation issue had handed over the documents of just the five representatives comprising the delegation and not of the remaining members.